March 27, 2017: Global Rights Alert will on March 28, 2017 participate in a high level conference in Washington DC, USA to discuss the East Africa oil boom. The event, jointly sponsored by Oxfam America & Johns Hopkins University, brings together extractive industry experts from government, private sector, civil society, media and the international donor community across the globe. Ms. Winfred Ngabiirwe, the Executive Director, Global Right Alert joins a team of 13 experts from Africa, Asia, America and other continents to discuss recent political and economic changes in East Africa and its implications on oil and gas development. The organizers, in their conference communication, say the conference will review what progress has been achieved in the oil sector in the last few years and what governance challenges lay ahead. Some of the topics to be discussed include; Money and Politics – The political economy of oil/gas in East Africa, Land for livelihoods or investments? Community rights in the context of extractives and the role of the international community in resource governance in East Africa. Ms. Ngabiirw’s session will tackle the topic; “Land for livelihoods or for investments?” Panelists will discuss the ways in which the rights and livelihoods of affected communities [in the mining areas] can be protected through the project cycle. Ms. Winnie will pay attention to how oil and gas project developments are being implemented and managed in Uganda right now and how they are impacting communities through evictions of communities from oil refinery, oil waste management facility and the court cases that have ensured. She will also bring to the attention of the world the main issues and concerns that are affecting local communities, especially women [in the oil sector] and what lessons can be applied to the upcoming Uganda-Tanzania pipeline. Oxfam says that recent discoveries of oil and gas across East Africa over the last decade have catapulted the region as the new frontier for hydrocarbons. Prospective extractive projects could spell billions of dollars in government revenue which, if managed responsibly, could finance much needed infrastructure, social services and ultimately transform the region. Yet since major discoveries in Kenya, Uganda, Tanzania and Mozambique were announced, oil and gas prices have stagnated and the once-promising investments suddenly seemed doubtful. By bringing together representatives from, it seeks to review what progress has been achieved in the last few years and what governance challenges lay ahead. Global Rights Alert is a national Non Governmental Organization established in 2008 with a vision of a community where human rights are realized. In pursuit of achieving this, GRA works through networking with other likeminded CSOs, CBOs, Policy makers, local communities and leaders. This we do in a bid to promote social accountability through constructive engagement of rights holders and duty bearers. GRA has grown to become a leading organisations working on natural resource governance in Uganda. The organisation has done tremendous work through public sensitization campaigns, capacity building, advocacy, and dialogues. This is aimed at strengthening public participation and access to justice as foundations of democracy, access to information, peace and security, among others. 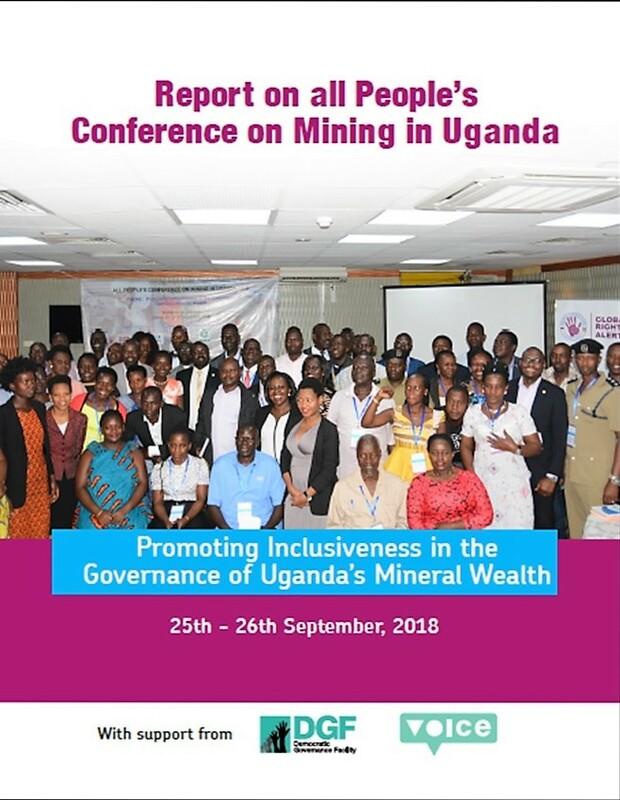 We believe that if well managed and sustainably exploited, Uganda’s Oil & Gas, and Minerals have the potential to steer the country towards achieving its development goals.